4.5 out of 5 based on 65 bloggers and 9 commenters. 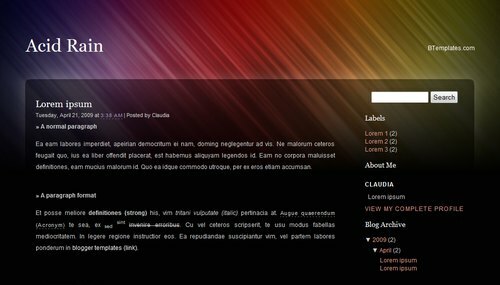 Acid Rain is a free blogger template with 2 columns, right sidebar and rounded corners. Great template, how do i download it? – download the template that you want and save it on your computer. – after download has finish, just double click the file. – log in to blogger right now. – click “Edit HTML” and then “Browse”. – Find out where you save the Acid Rain (xml). – after the file appear in the “Browse” box, click “Upload”. whhy is it invalid or invalid file name?? why can’t i download it? Would it be easy for me to convert this template into 3 columns? Probably by shrinking the width of the post column and adding another column on the right or even left? If I can, do you know anywhere online that would show me how to do this?